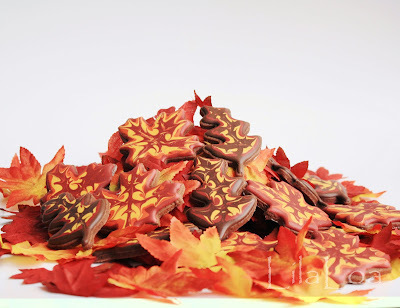 I'm warning you right now -- these leaves are so fun to make that you won't want to stop. You're just going to keep on making them right through dinner time. And bed time. And hitting the snooze button over and over again time. First...bake some cookies. 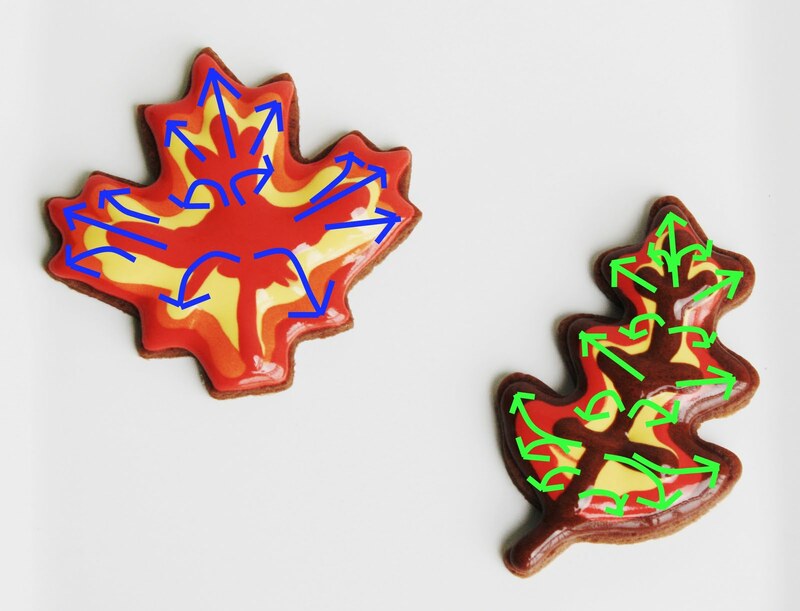 It's best for everyone if you just go ahead and bake those cookies in a leaf shape of some kind. And gather up some supplies. You know, like snacks and a drink and...well, get what you want. But while you're getting, make sure you get some fall colored icing (12-15 seconds thick), some #3 tips, and some toothpicks. These cookies go real, real quick. I recommend doing just one cookie at a time. But for the sake of the tutorial I did two. Oh, and its best if you decide on your color pattern BEFORE starting the cookie. Anyway, pipe on your outside layer first. Pipe around that with the next color. And if you disregard my previous advice to only do one cookie at a time, at least only do one color pattern at a time. Or you will mess up. And be mad. Maybe at me. And, that's not healthy for either of us. Then pipe your third color right inside the other two. There is no real need to be neat here. Just be quick. Take the original outside color and pipe that into the remaining spaces, and vaguely in the pattern of the veins of a leaf. And this is the tricky part. Not to do, but to explain. Take a toothpick and draw from inside the vein color out towards all the points on the leaf. And make some additional points all crazy like. You can really do what you want here, but if you want some guidance, check out the arrows above. (I told you it was all crazy like.) Don't bother wiping your toothpick off unless it gets globby. The leaves look better when there are bits of different colors all over the place. Done and done. I did both of these in about 90 seconds. WHILE taking pictures. I'm telling you... you are going to LOVE making them!